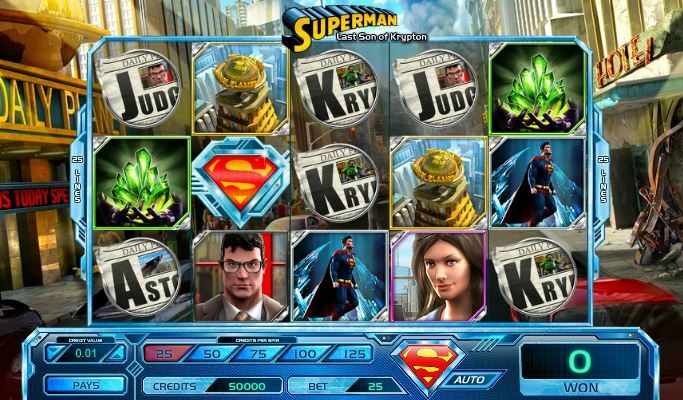 Superman: Last Son of Krypton is a slot machine, it was designed by Cryptologic, and as you might’ve guessed it is themed around one of the most popular superheroes of our time, Superman. This particular slot machine is built under license and is based on a novel which has the same name, published in 1978. The writer is Elliot Maggin. Superman themed slots exist already out there, but few manage to look as good as this one, which is not even based on a comic book, but on a novel. This is a slot with 5 reels, with 25 paylines and using a combination of different types of wilds and features which give you free spins and multipliers. A $25,000 jackpot awaits you if you get the right five symbols together. The game relies quite heavily on wilds when it comes to the features that are offered. There are regular wilds in the slot, morphing wilds, a feature called Lois Lane Wilds Hearts (with free spins, wilds and multipliers) and another one called Lex Luthor Frozen Wild (also with free spins and multipliers). 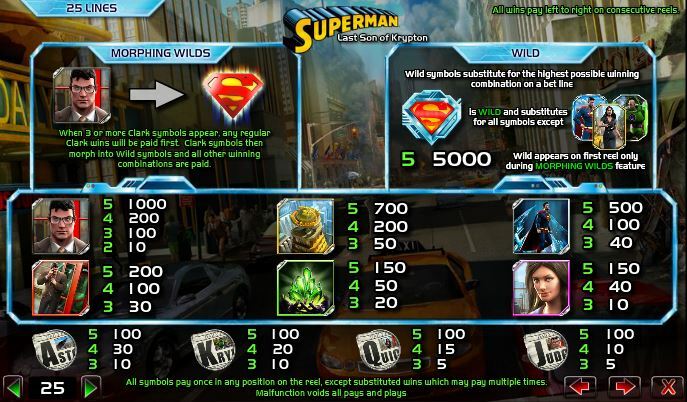 The Superman Logo, that red S on a yellow background, will be used by the slot for the role of the wild symbol. A wild will always substitute and try to take the place of other symbols, when this makes sense and it brings the player the highest possible win. The symbols with Clark, Lois Lane and Lex Luthor can’t be replaced with a wild, but it will work with all the regular icons. It also is capable of forming up its own combo of five symbols, in which case it gives you a 5,000x prize. The Clark symbol is a regular one normally, but in certain situations it can morph into a wild. This happens whenever 3+ Clark icons appear. They pay whatever wins are available, and then they morph into wilds and hopefully new wins will form. This is a feature which needs two different types of symbols to start up. Superman has to be on the 1st reel, while Lois Lane is on the 5th. 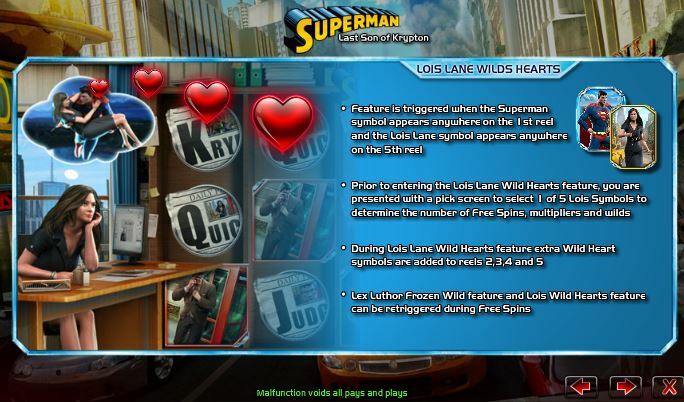 First of all, you get a screen where you have to choose one of the five symbols with Lois, and this will tell you how many free games, wilds and multipliers you will have. Additional Wild Hearts will be added on the last four reels. You can retrigger the feature, with the same symbols, while the free spins are running. This particular feature also needs a combo of two symbols. Superman has to be on reel 1, while Lex Luthor is on reel 5. You are presented with five Lex symbols on a new screen, and you have to choose one. You find out this way how many free games you have and what multipliers will apply to the wins. 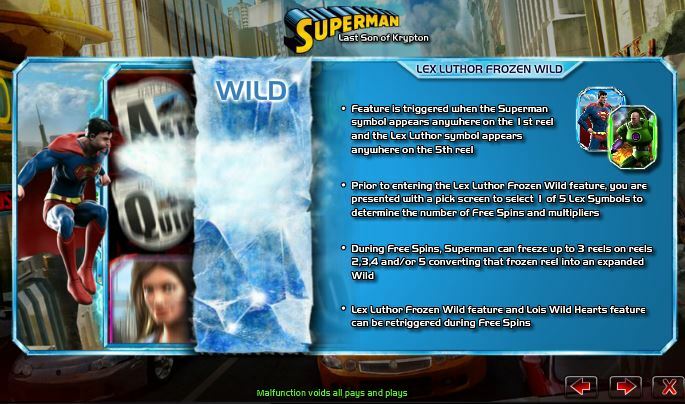 As the free spins are used, Superman can make up to three reels to freeze and become expanded wilds. The reels which can be frozen are the 2nd, 3rd, 4th and 5th. Placing a bet is done with up to 5 coins per line, or 125 coins total. You will find the denomination option at the bottom, right next to the coin selection. You can go with 25, 50, 75, 100 or 125 coins, so you use 1 to 5 for each line. Denominations vary between $0.01 and $1, so you can expect a maximum bet of $125. The paytable modifies the number of coins you can win based on the wager you place. With 1 to 5 coins used per line, the maximum prize is between 5,000 and 25,000 coins. As for the cash value, it’s up to $25,000 when $1 coins are selected. Though generally I have high expectations from all slot machines that are designed under official license, few of them actually manage to be truly great titles. 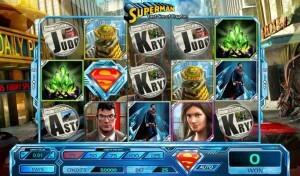 I was impressed with the design of Last Son of Krypton, definitely my favorite Superman slot machine. The symbols are excellent, highly detailed and in a modern cartoon style, so they’re not like the ones you see in comic books. A nice touch is also the use of the Superman Logo for the Spin button. Symbols: Superman Logo (wild, 5,000x), Superman (bonus), Lois Lane (bonus), Lex Luthor (bonus), Clark (1,000x), Daily Planet HQ (700x), Superman in ice (500x), Clark in booth (200x), Kryptonite (150x), Lois Lane Close-up (150x), Ace Newspaper (100x), King Newspaper (100x), Queen Newspaper (100x) and Jack Newspaper (100x). 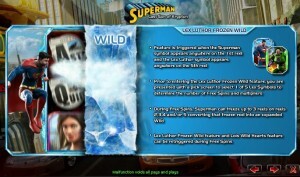 It’s one of the best slot machines you will find not only based on Superman, but on any other comic book. It’s got an excellent design and its features are not your run of the mill scatters and free spins, looking like they actually put some thought into it. The title is the same as that of a novel which Elliot S. Maggin wrote and which was released in 1978. The inspiration obviously comes from the Superman character that DC Comics made famous. In this novel, you can read about the superhero’s life story. You find out about how he was born on Krypton, how he grew up in Smallvile, became Superboy and then moved to Metropolis and became Superman. 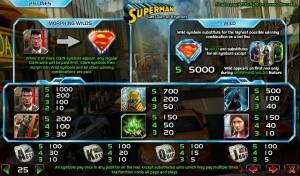 This Superman Last Son Of Krypton slot is offered by all online casinos with Cryptologic software, playable either in practice or in real money mode.